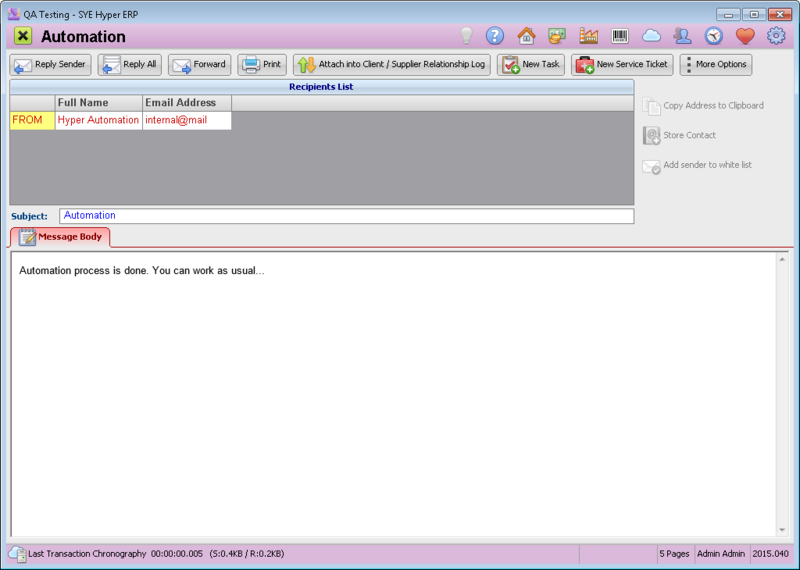 Double click on an Email message will open the message window. At the top of this window, the sender and the addresses details are displayed (except of hidden addressees - BCC). Reply Sender Reply the sender of the chosen message. Reply All Reply all recipients of the chosen message. Forward Send this messages to other recipients. Print Print the selected message. The system will display print preview. Advanced Features Open the selected message. The action buttons will be displayed above the message. Tasks - the content will be copied to the Subject field. Service Ticket - the content will be copied to the Subject / Complain field. Show Deleted When this checkbox is marked, only deleted messages will be displayed. For regular display unmark this checkbox. Delete Delete the selected messages. Deleted messages will be archived. Show Hidden Attachments - Display files that were attached to the message body. Save Original .eml File to disk - Save message as .eml file on the local disk. Copy body source to clipboard - Copy the source code of the messages body and make it available to paste on local computer. Copy Address to Clipboard Copy Email address to clipboard and make it available to paste on local computer. Store Contact Add contact details to contacts list. Add sender to white list Cancel the Spam label for the this sender. Sender will be marked as Spam by the system, according to definitions of the users authorization (Employees Module), in the "Spam Filter" field.